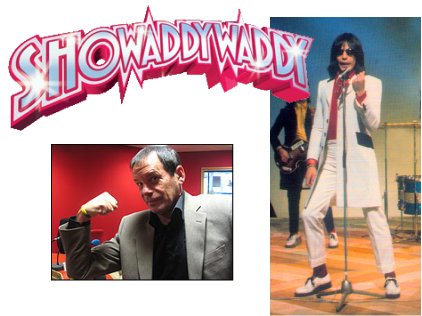 Born in March 1952, Dave Bartram has been lead singer with Leicestershire based rock band Showaddywaddy for nearly 40 years. Their hits include the No1 smash Under The Moon of Love as well as 10 Top 10 singles including Dancin' Party, Pretty Little Angel Eyes, When. They also had self penned hits Hey Rock 'n' Roll, Rock 'n' Roll Lady & the 1974 Christmas hit Hey Mr Christmas. LTID: Have you always followed Leicester City & from what age? DB: FROM THE AGE OF 6! LTID: Can you remember the first game you saw? LTID: During the 70’s when your band ‘Showaddywaddy’ were at height of their fame were you able to get to many matches & if you did what was the fans reaction to you? DB: I STILL WENT TO A LOT OF GAMES, AND WAS PRIVILEDGED TO SIT IN THE DIRECTORS BOX ON MANY OCCASIONS, OFTEN NEXT TO MATT GILLIES THE EX CITY MANAGER. WHAT A GENTLEMAN! LEICESTER FANS ARE REAL AND WHILST THEY ALWAYS SHOWED RESPECT, THEY NEVER CRAWLED OR BOTHERED ME. LTID: People who remember the Bloomfield years of the 70’s remember them as being the years when we played our best football, although we didn’t win anything. Would you agree with this? DB:A FANTASTIC ERA, WITH 4 ENGLAND INTERNATIONALS , I.E. SHILTS, WHITWORTH, FRANKIE & KEITH WELLER - IT’S UNBELIEVABLE WE NEVER WON ANYTHING. LTID: Did they ever play a Showaddywaddy record at Filbert Street when you were there and how did it feel? DB: OH YEAH, ALL THE TIME. I LOVED IT WHEN THEY DID! LTID: If you hadn’t been in a famous band, would have wanted to be a footballer? DB:I WAS A HALF DECENT KEEPER, BUT NEVER GOOD ENOUGH TO HAVE BEEN A PRO. LTID: If you could have been either, which would you sooner have been? DB: A MUSICIAN – I WOULDN’T STILL BE PLAYING FOOTBALL IN MY LATE 50’S! LTID: Did you ever play for any teams as a kid growing up & if so what position did you play and how good were you? DB: MAINLY AT SCHOOL, ALTHOUGH I HAD SOME GAMES FOR THE POST OFFICE TELEPHONES TEAM. LTID: What has been your favourite ever Leicester City game & why? DB: WE BEAT MAN CITY IN THE CUP IN THE 60’S 4-3 AFTER BEING 2 DOWN I WAS STOOD ON THE KOP AND TO THIS DAY HAVE NEVER EXPERIENCED AN ATMOSPHERE LIKE IT. LTID: What was your biggest disappointment following Leicester City? LTID :Who is your favourite Leicester player, past & present? LTID: You have seen many managers come and go over the years, who would you say was the best manager LCFC have ever had & why. LTID: By comparison, who has been the worst you can remember & why. DB: TATER PEELER – HE ALMOST SINGLE HANDEDLY DESTROYED WHAT M.O.N HAD BUILT! LTID : Who are your footballing heroes? LTID: Who are your musical heroes? LTID: Was there one game in particular you missed as you were touring with Showaddywaddy that you would say ‘wish I’d been there’? LTID: The change since Sven took over has been immense, but was letting Nigel Pearson go a big mistake? LTID :Do you think Sven can get us promoted this season, or is it too big an ask? in the "Scenes we'd like to see" round. Does this make you smile or do you find it irritating? DB: IT MAKES ME LAUGH, BUT MY OWN SAVILE IMPRESSION IS BETTER! LTID :You are currently on tour with Showaddywaddy have you had the chance to see any games since Sven took over? DB :I’VE SEEN 8 HOME GAMES THIS SEASON. I STILL FEEL THAT WE LACK A GREAT LEADER, AND DROPPING WEALE WAS JUST STUPID! LTID: You first came to prominence on the Talent Show ‘New Faces’. Were the judges as bad as (those of us who are ole enough to remember) they seemed and would you say they were nastier than Simon Cowell? DB: NOEL GORDON, CLEMENT FREUD & MICKIE MOST WERE THE JUDGES WE WON EASILY AND NO ONE SAID ANYTHING NASTY. MICKIE TRIED TO SIGN THE BAND, BUT WE WERE ALREADY SPOKEN FOR. LTID : If you could perform just 1 Showaddywaddy song at a pop concert at The Walkers, which would it be and why? LTID; Do you still enjoy touring? LTID: Which was the concert that you have enjoyed doing the most & for what reasons? DB: DE MONT IN DECEMBER 1978 WHEN WE FOUND OUT OUR ALBUM WAS NUMBER 1 FOR CHRISTMAS. AMAZING NIGHT! LTID: Flipping the coin, which was your worst ever concert, maybe one where everything went wrong? BUSINESSMEN IN BIRMINGHAM. THEY WERE MORE INTERESTED IN MAKING ADVANCES TOWARDS THEIR SECRETARIES THAN THE BAND & WE GOT TOTALLY IGNORED. LTID: Are your audience ageing with you, or are you attracting younger fans to your shows? LTID: Are footballers the new ‘pop stars’ of the celebrity world? LTID: If you had to choose a show for Showaddywaddy to appear on now would you choose Britain’s got Talent or X Factor? LTID: A group has never won the X-Factor, if Showaddywaddy went on how do you think they would do? DB: WIN OF COURSE. PLUS LOUIS WALSH HAS ALWAYS BEEN A FAN OF THE BAND.